Insert stock Bible image here. Obviously, I’m a fan of books. I always have been and I always will. Ever since I got the call to ministry, those books have tended to be about theology and the Scriptures, and that only intensified once I got to seminary. Systematic theology, biblical studies, commentaries, and works of Christian history litter the floors of my office, bursting off of the shelves I have for them (also, I need to clean up a bit). 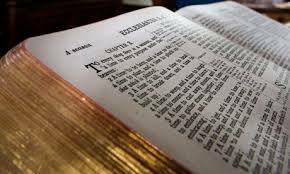 Those books have shaped me, grown, and deepened my knowledge of the Bible, the gospel, and God himself. One of the sad quirks of becoming a student of theology and the Bible, though, is that you can actually end up losing your drive to read the Bible itself. Somewhere in the rush to consume as many studies on Paul as you can afford, you begin to realize, “When was the last time I really just sat and read through Paul?” I mean, I still read a couple chapters of my Bible for a daily devotional, but there’s a point where I realized the proportion of pages of Scripture compared to pages about Scripture, got wildly out of hand. I’m fairly sure I’m not the only one this has happened to. Now, to be fair, when you become a student of the Scriptures, to some degree it makes sense to do a bunch of reading in commentaries, studies, and so forth. In order to really get at the depths of a particular text or settle the meaning of a particular difficult verse that takes about 15 words, you may have to read 30 or 40 pages. Still, lately I’ve been convicted that I need to start tipping the balance back, if not completely in the other direction, at least more than it currently is. So, I’ve come up with a very simple plan. I’m going to try to go on a “chapter between chapters” plan. In other words, on top of my daily, morning reading, after every chapter I read in work of theology or biblical studies, I’m going to pop open my Bible and read a chapter there too. Obviously, the chapters in my theology texts are going to be much longer than the biblical chapters, but this is a fairly straightforward way of ensuring that I’m engaged in the Biblical text throughout the whole of my day alongside my broader theological studies, not simply during sermon prep or those special little chunks of devotional time. Which books will I read in particular? Well, I suppose I’m going to start with the four gospels. Recently, Mark Labberton mentioned that for a great many years he’s made it a practice to, whatever else he was studying, make sure he was reading at least one of the Gospels. While all of Scripture testifies to Christ, looking clearly at his person, his way of speaking and engaging with his followers and outsiders in the Gospels ought to be formative in the lives of his disciples. That sounds like wisdom to me. Am I saying that everyone else needs to do this? Not really. But I figured if you’re like me and you want to find ways to dip into Scripture more, it might help to have a plan. A chapter between chapters just might be it. I need this in Seminary.